I just got this great salt and pepper grinder from The Salt & Pepper Grinder Company. I love this grinder because it is super stylish. It’s a combo grinder so one end is for salt and the other is for pepper. Just open up the ends and add salt to one and pepper to the other. Pop off the top and grind out your fresh salt or pepper. I love to have fresh ground salt and pepper on my food so I love having it all in one container. It’s super stylish too. I leave mine out on the table and it looks so nice and stylish. It’s plastic and stainless steel but it has a very sleek look. It’s really a nice piece. 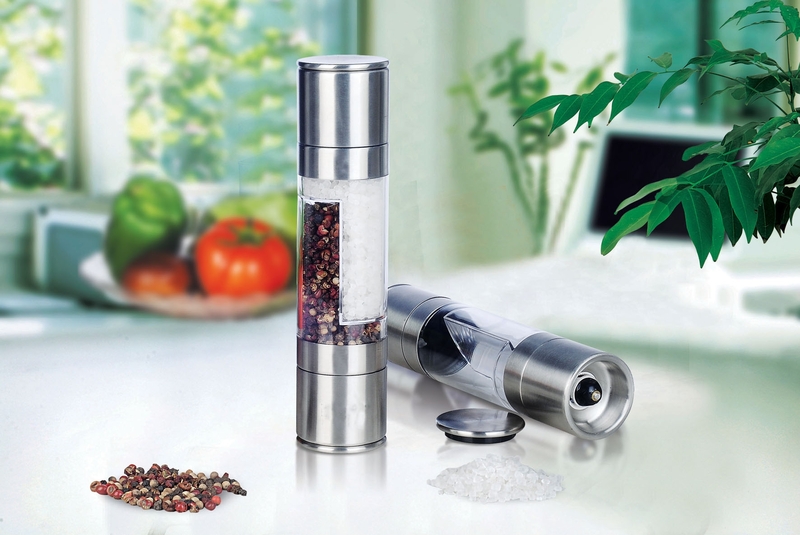 LATEST DESIGN MANUAL SALT & PEPPER GRINDER SET – This Latest Sleek Design 2 in 1 Grinder model is Extreemly Durable and uses only High Quality Stainless Steel and Ceramic Stone Components. Easy to Clean and Comes with Airtight Steel End Caps. UNIQUE CERAMIC BURR CORE GRINDING MECHANISM – Newly Re-Designed Ceramic Stone Burr Grinding Cores at Both ends, which Never Rust and Easily Adjust. CONSISTENT GRINDING – Fully Adjustable Grinding Mechanisms ensures a consistent grind size ranging from Coarse for Sea Salt & Pepper to very fine for Cloves etc. UNIQUE 2 in 1 ACRYLLIC VIEWING CHAMBER -Sleek Food Grade Acryllic Makes for Easy Viewing and Ensures Safety and Durability. LIFETIME GUARANTEE – Purchase with Full Confidence that in the Unlikely Event of Dissatisfaction you can recieve a Full Refund.